Our first RV came from the factory with one type of heat is propane. We had two furnaces that kept us warm but they burn through propane pretty quickly so we bought an electric space heater to give us an additional heating option. When we bought our new RV in 2005 the addition of combination heat pump air-conditioners was a big plus. Since it also came with a furnace we could now heat our entire RV using either electricity or propane, but even with two types of heat available the more options we have the better. Depending on the temperature and weather we’re hooked up to shore power or not we make different heating choices. Related: Why do you need Penton 300w 51 Inch Light Bar? The pros are that the use of electricity the cost of which is generally included in a nightly or weekly stay at RV parks with hookups. It creates dry heat which helps reduce moisture buildup and condensation inside the Rick which is a common concern when RVing in cold weather. 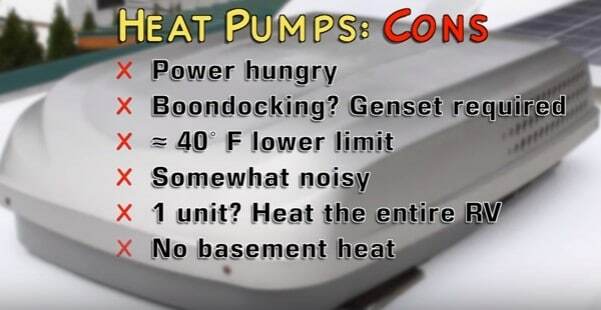 The downside of it is that they’re fairly power-hungry having a 30 amp hookup is usually best for running one and 50 amp is best if you’re running two or more at the same time. Also if you’re paying a monthly rate for a site you’ll usually have to pay extra for the power you use. Lastly, since they won’t work below about 40°F they can’t heat the basement to protect water lines from freezing. On the upside, they warm the RV quickly and efficiently no matter how cold it is outside since they run on propane there is no electrical hookup needed. There already included with the RV so there’s nothing extra to buy or install. If you have a basement the furnace can route heat down there to prevent plumbing from freezing. The vent externally so they won’t contribute to moisture and condensation build up inside the Rick. If you have two of them like we used to then the two zones give you the flexibility to heat just the front or the rear of the RV. Installing an extended stay onto your onboard propane tank will allow you to connect an external tank providing a fuel supply that can be replenished without moving the RV. The downsides of furnaces are that they use a lot of propane. 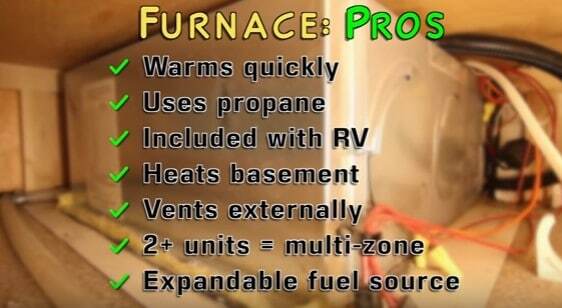 A single furnace can easily use more propane than your stove, oven, refrigerator and barbecue grill combined and is the primary reason we rarely use ours. They’re also pretty noisy but just like a heat pump the noise is primarily the sound of fans running inside the RV it’s nothing that will bother your neighbors. Fans run on 12 V electric so using battery power is a factor to consider when boondocking. If you only have a single furnace like we do using it requires heating the entire RV whether you want to or not. 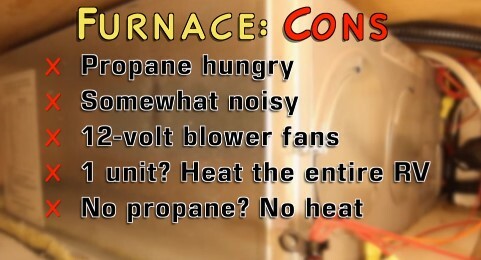 Lastly, if you run out of propane you have no heat connecting to shore power or firing up the generator won’t make a furnace work without propane. 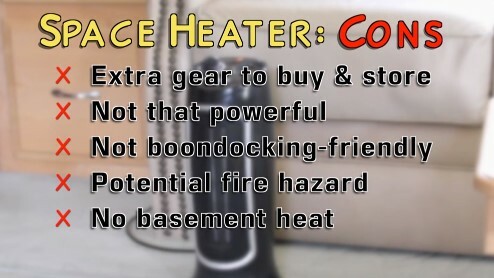 Electric space heaters have a lot of pluses which probably accounts for their popularity. They provide focused heat so you can aim exactly where you want. There is generally no cost for using it when you’re staying in a park with shore power if you’re already paying for a nightly or weekly stay although some parks do claim to charge an extra fee if you use electric heat. There inexpensive small and easy to store. They produced dry heat which helps keep moisture and condensation down. They’re generally pretty quiet. There are tons of models providing lots of options for size and heat output. You can buy one anywhere and are easy to bring back and forth between an RV and a sticks and bricks house if you’re not full-timer. As nice as space heaters are there are a few downsides since they don’t come with the RV it’s something extra to buy and store they don’t have enough heat output for a large Rick especially in a really cold condition. Although you can use more than one at a time if you have 30 or 50 amp connection. They need 110 V electricity so they’re not great for boondocking except when the generators running. You do have to use common sense and keep flammable items away from them. This brings us to one of our favorites but also most controversial ways to keep warm is Vent free propane heater. We’ve used ours for years and absolutely love it. 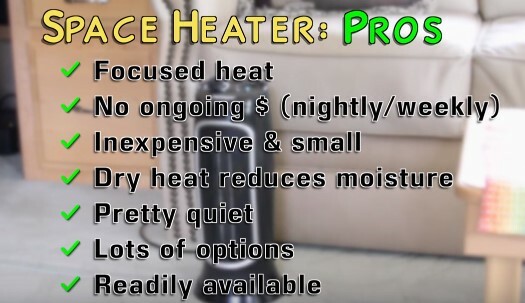 Of course, we already know that like every other heat source there are both pros and cons. On the plus side the heat output is fantastic like sitting in front of the fireplace they’re extremely fuel-efficient absolutely sipping propane. There also totally silent and the use zero electric power all of these things make them extremely good for boondocking which surely accounts for their popularity in the desert. On the negative side, it’s something extra to buy and find a place to store. It does use propane so proper use and care is required to prevent a fire which includes keeping flammable items away from it. Although we did the job ourselves they generally require professional installation to connect to the RV’s propane system. Some models use replaceable propane canisters which require keeping extras around and also replacing them when they’re empty instead of running off the RVs built in the tank like we do. They also generate moisture which requires ventilation although leaving a window cracked is often needed in cold weather anyway to reduce the moisture from showering, cooking and breathing. They use oxygen so require ventilation although as mentioned you have to leave a window cracked to reduce moisture. They require both carbon monoxide and propane detectors but most RVs should already be equipped with those just make sure they’re working. If you have kids or pets you’ll need a model with top over protection we have neither so we don’t need that feature. These are all the heating systems that we have personal experience with but there’s another popular source that many higher-end RVs come equipped with a standard or optional equipment. The pros include the fact that they generally run on diesel which is, of course, a plentiful fuel source on diesel RVs. In addition to diesel, some models can run off the engine or electricity allowing them to take advantage of the engines heat while driving or shore power when hooked up. They’re quiet and efficient with small fans providing the warm air and diesel being a highly efficient source of BTUs. Multiple zones allow control of which parts of the rig get heated and they put out and even comfortable heat and added bonus is that they provide virtually unlimited hot water. 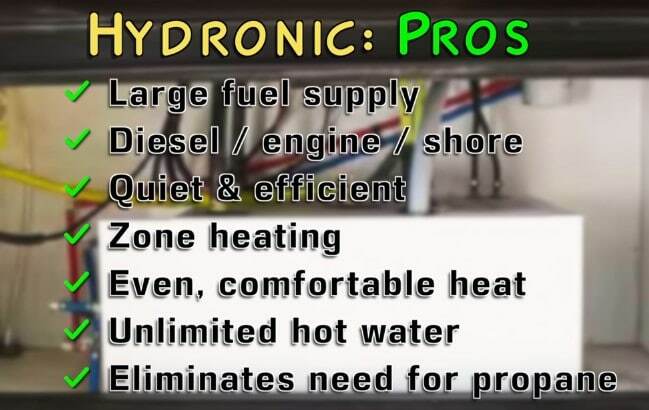 Having a hydronic heat system allows an RV to be all electric which can eliminate the need for propane completely optional engine and basement heat can preheat the engine in cold weather and protect the plumbing in the basement from freezing. 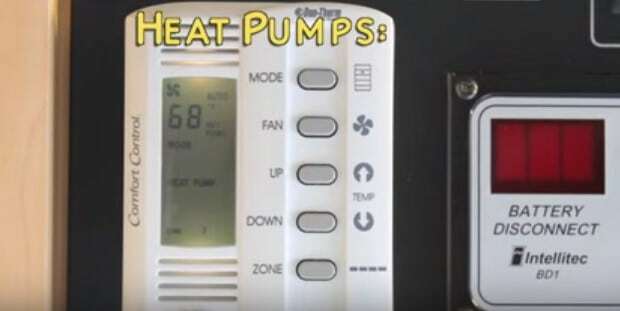 You can see that hydronic heat has lots of pros with probably accounts for why people said that once they experienced hydronic heat they’d never be without it again but like every other heating option there are some drawbacks too. The biggest one being that they’re very expensive, quite complex requiring more maintenance and added the potential for repairs. The fans and circulation pump use 12V power so that’s a factor to consider if you plan to boondocks. there is also some potential for diesel fumes outside the RV although we’ve heard a lot less about that in newer units. A system failure would take out both your heat and hot water there also not available on all types of RVs generally only the more expensive ones. Depending on the weather and where your camping hooked up to 50 amp service for boondocking in the middle of nowhere. There are plenty of choices and combinations of solutions to consider. What’s your favorite way to keep warm in your RV leave a comment and add your thoughts experience or questions to the discussion below. Previous Post: Why do you need Penton 300w 51 Inch Light Bar?